Dig into these recipes to discover your panini press's impressive range—including breakfasts, lunches, snacks, and dinners--for the weekday whirl and for relaxing times on weekends. 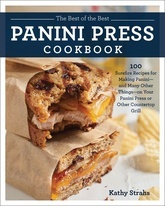 About half the recipes in this book—a collection of the 100 best recipes from Strahs' earlier book, The Ultimate Panini Press Cookbook—are for panini, such as a robust Cheddar, Apple, and Whole-Grain Mustard Panini or a zesty Chimichurri Steak Panini. The remaining recipes are for dishes you will be amazed to learn you can make on a countertop grill, including quesadillas, croques monsieurs, brats, burgers, salads topped with crisply grilled meats, and even grilled desserts! Copyright © 2017 Bookspan. The Good Cook ® is a registered trademark of Bookspan.